So many weddings, so little time! We love a well-stitched lehenga, to be honest. But everyone we know is getting married. 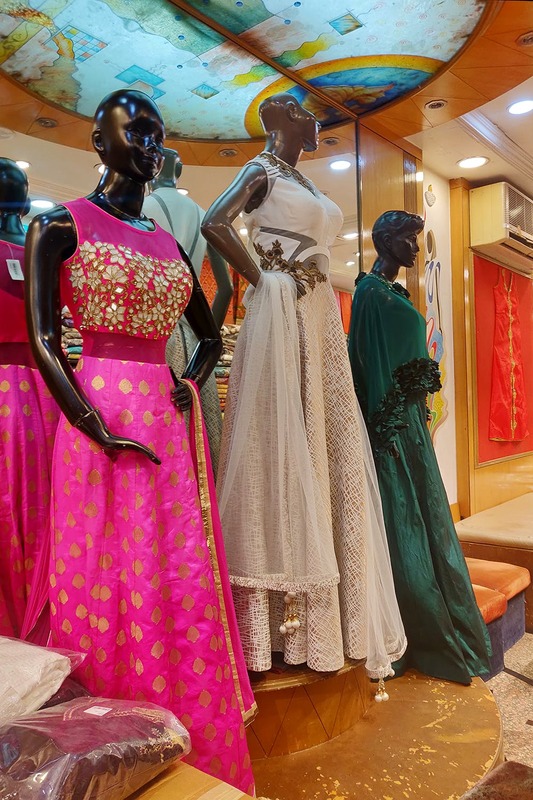 So for a quick fix, we found Aanchal in Camp that has readymade lehengas and gowns with ethnic detailing. Along M.G. road you’ll find numerous shops to buy the latest trend from. Aanchal has been around for a long time, but it’s a space where you and your mom, both will find something. If you’re shopping alone, don’t be deterred by what the mannequins adorn. We saw an emerald green gown with a sheer cape and ruffles on the border, which would be apt for a reception or a cocktail evening. At INR 10,000 we’re sure it would make heads turn. For INR 12,000 we saw a bright blue lehenga with gold brocade motifs and a sunny yellow, cold-shoulder choli with some sequins work to complement it. They have a lot of different designs that you could choose from. It’s a traditional store that sources clothes from local manufacturers. So you can sit and browse several designs, before you make a decision. Aanchal also has sarees but those are more traditional than trendy. And, they have casual dress materials that you could get stitched too. Their lehenga sets start at INR 5,000 and you can get ethnic gowns starting at INR 6,000. We’d love to see other options in ethnic wear too. We’re thinking asymmetrical tunics with palazzos, dhoti pants, shararas and other such outfits that everyone’s wearing these days. Pick up lehengas for the wedding ceremony here to look more traditional. You can slip into indo-western outfits for other events.